Former Philadelphia sportscaster Don Tollefson has been ordered held for trial after he waived his right to a preliminary hearing in a Bucks County court Thursday morning. He is accused of selling ticket and travel packages to individuals and groups under the guise of charity but never delivering the goods. Originally charged with stealing $100,000, prosecutors expanded the scope of the case today saying that there are more than 150 victims totaling $250,000. 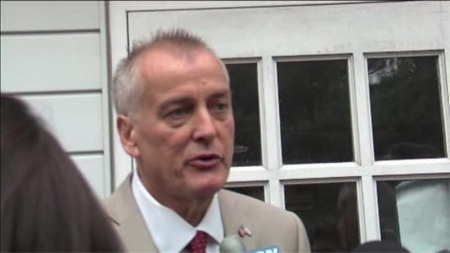 Prosecutors had witnesses ready to testify against Tollefson today in the Warminster courtroom before he waived the hearing. The judge told Tollefson that he was “a respected member of the community who had credibility” and “this whole affair is a big disappointment for the people of the Delaware Valley.” Defense attorney Sharif Abaza noted that his client is working daily to fight his addiction problems. The New Jersey Department of Health reports that a majority of the residents of Paulsboro, NJ, became ill after a tanker train derailed and spewed toxic vinyl chloride gas in November 2012. Health officials began surveying Paulsboro residents two weeks after the derailment. They received approximately 2,000 responses or 1/3 the town's population. 1,200 people had suffered headaches, respiratory problems, eye problems, dizziness, or nausea. 100 people went to the hospital and 25 sought emergency treatment. More symptoms were reported closer to the spill. The National Transportation Safety Board requested the survey. You can find the entire report posted here. The cool and cloudy weather wasn't the most unpleasant thing to great some residents in the Holmesburg section upon waking up Thursday. At least 7 cars on the 4200 block of Frost Street had their tires slashed sometime overnight. Some drivers did not discover their damage until they were out on the road, blowing tires while on I-95 or driving to work. Residents are frustrated with the unexpected costs of replacing tires, already on tight budgets. Police collected fingerprint evidence on several tires and will go through surveillance cameras in the neighborhood, many of which are owned by the residents.